What’s better for the week of the Fourth than a classic red, white and blue room? This guesthouse in Connecticut is all about Americana without going too cheesy. I think the red and white patterned rug is gorgeous, and really like the mix of patterns with the blue and white striped chairs and the pillows. 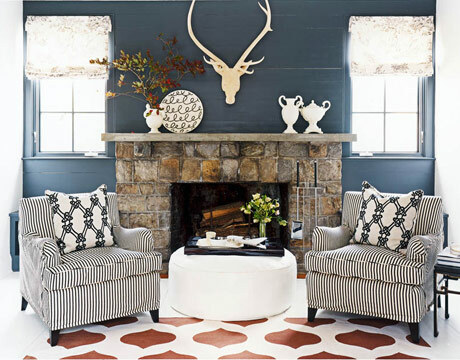 I’d like to see this room styled a little less stuffy — I want to get in there and put crazy things all over the place — but doesn’t it look like a cozy spot to curl up in front of the big stone fireplace? It’s easy to go overboard when decorating with these colors (no flags, please! ), but red, white and blue done right is a color scheme that is so familiar that it just reads comfortable, classic, and easy. What do you think? Would you ever decorate a room in red, white and blue?